When you hear an author’s name enough you become interested. I had heard of Leigh Bardugo a lot lately and decided to give it a try. Six of Crows has had such rave reviews I was afraid to not like her style for something so widely loved. So, I chickened out of starting there and picked up her previously published trilogy, the Grisha trilogy, instead. (Plus, I had a gift card and got the box set.) 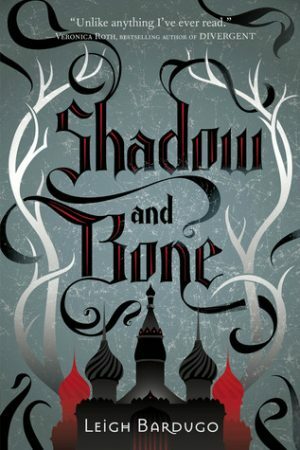 So, let me tell you about the first book in the trilogy, Shadow and Bone. Let me start off this review by saying I liked this book. However, I didn’t absolutely love it. That isn’t to say you shouldn’t read it. I think I just picked a bad time to begin reading it. I should’ve known better than to start a trilogy in the middle of a reading slump while also dealing with a lot of health issues. But, here we are, so let’s talk about the book. Like most YA novels there is the ever present “formula.” An apparently plain girl as our narrator, a love triangle and the need to overthrow an evil power. Sounds familiar, right? If you find yourself tiring of this formula please don’t read this book just yet. It’s pivotal and while it is well done, reading more of the thing that bugs some readers about YA novels only serves to prove the point that most people believe: it’s not the only way to write a story. However, it is effective and in this book we see it done, if not amazingly, done well. Alina, an orphan, along with her friend Mal are raised by a kind duke. Seems nice, right? When they are children, as is tradition in Ravka, they are tested for any talents they may possess. Neither Mal nor Alina are shown to possess any powers so, therefore, they are left to be raised together and eventually join the army together. Alina is a map maker and Mal is a tracker. They are in the same unit and have grown up together, each teasing the other as you would an old friend, but protective like you’d expect people whose lives are so intertwined. Of course Alina has a small crush on Mal but rather than dwell on it, or who Mal is will, Alina focuses on what she can control which I see as a positive example of not letting a crush control your life. In the nation of Ravka there is an area known as the Shadow Fold that has divided the country. It is an area of Darkness, filled with monsters and deadly things. An area that, unless you travel through it carefully, you will die. Of course, when Mal and Alina’s unit travels through it something goes wrong but, the surprising part is Alina reveals her dormant power and saves not only herself and the lives of others on their skiff but the life of her best friend Mal. It is this power, that while important, drives a wedge between them. Alina, whisked away to be presented to the Darkling and trained in her latent power, loses contact with Mal. Thinking that he doesn’t care for her Alina focuses on her power, the new world she finds herself in and on the Darkling himself who is charming, mysterious and has a special kind of hold over Alina. (This is where anyone who hates love triangles will groan). We learn that Alina needs an amplifier to better control and use her power, to help the Darkling destroy the Shadow Fold. However, as usual, not everything is as it seems. When Mal and Alina reunite it is under distressing circumstances and the pair must put aside all their issues and long hidden feelings to survive. I don’t want to give away what happens, who Alina ends up with or anything of the sort close to a spoiler but I’ll say this: the book took me a while to get into it but once I did I enjoyed it. I was also very glad I bought the box set as I was able to immediately start on book #2, Siege and Storm. Some reviewers complain about the YA formula, about the apparent poor integration of Russian culture (I’m not an expert so I won’t comment on it) and a few other things but overall the book was well written and I look forward to reading more by this author.